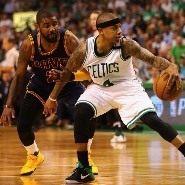 Kyrie Irving, who had asked the Cleveland Cavaliers to trade him because he didn’t want to play with LeBron James anymore, had his wish granted when he was sent to the Boston Celtics in a trade for point guard Isaiah Thomas, forward Jae Crowder, center Ante Zizic and a pick in the first round of the 2018 draft. Thomas recently completed one of the best offensive seasons of the last few years, and if he was already an idol for the Boston fans, he became a local sports icon for playing in the playoffs after his sister’s death. But Thomas was not a perfect fit for the Celtics because he already is 28, will be a free agent in 2018, was asking for a multimillion-dollar contract extension and has dealt with hip problems that raised doubts about how he will evolve as he grows older. Irving, like Thomas, is one of the best scoring point guards in the NBA, but he’s only 25 years old and has two seasons left on his contract, which fits the Celtics plan just fine due to his youth. Since the day Irving made his shocking request to Cavs owner Dan Gilbert, the reigning Eastern Conference champions had sought a team to trade him to. They agreed to deal with the Celtics, who despite being a team they will most likely have to face on their way to another NBA Finals bid, was the most beneficial trade partner. Although the Celtics have replaced four players from last season’s starting five, Boston now hopes that Irving, Gordon Hayward (the most coveted free agent this summer) and Al Horford can lead them to their first NBA Championship since 2008. If Thomas was a pivotal player for the Celtics in clutch moments, Irving has already also proven he can deal with pressure and carry the load when needed. Irving was the MVP of the 2014 US Men’s World Cup team and played a decisive role helping the Cavaliers secure the first franchise title against the Golden State Warriors as he scored a vital three-point shot that turned the game around in the last minute of the 2016 NBA Finals’ seventh game. Irving was the MVP of the 2014 US Men’s World Cup team and played a decisive role helping the Cavaliers secure their first franchise title against the Golden State Warriors as he scored a vital three-point shot that turned the game around in the last minute of the 2016 NBA Finals’ seventh game. Remember that the Warriors were up 3-1 in those Finals and many people were anticipating another title for Stephen Curry’s team until Irving rose to the occasion and along with LeBron led the team’s furious comeback as they won three games in a row. For the Celtics the bet is risky, but they have a safety net. Crowder was a solid player for the team, but in the last two drafts, the Celtics have picked Jaylen Brown and Jayson Tatum, two promising forwards that could help them cope with losing Crowder. Under the direction of Brad Stevens, the Celtics project has gone through several stages and last year they were the best team in the East in the regular season. They made it to the Conference Finals, but Cleveland proved to be ahead of them by far. That’s why this summer the Celtics have pushed hard for trades. Interestingly and ironically these two teams meet in their first game of the season on October 17, a game that will be the first step to determine who won this trade and is already garnering the attention of all basketball fans and media from all over the country.